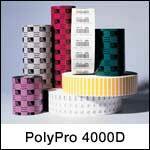 The PolyPro 4000D (formerly PolyPro Direct 2000) is a matte topcoated white direct thermal polypropylene label stock that produces high-quality black bar codes and human readable fonts. Features a high-performance acrylic adhesive. Ideal for applications that require a durable moisture resistant label stock. Compatible surfaces include paper, corrugated, glass and plastics. Compatible with Zebra QL Series mobile printers. 2.00" x 1.00" direct thermal polypropylene label on a 0.75" core. 350 labels per roll / 36 rolls per case. Zebra LD-R7BL5B special features - Non-perforated. No ribbon required. 2.00" x 1.25" direct thermal polypropylene label on a 0.75" core. 280 labels per roll / 36 rolls per case. Zebra LD-R2BF5W special features - Non-perforated. No ribbon required.